Green candela wrappers were once very popular with American cigar smokers. So much so that candela wrapper leafs—which go through a special quick and hot fermentation process that locks in the green color—were known as “American Market Selection,” as opposed to more traditional brown “English Market Selection” wrappers. These days candelas are less popular and more of a novelty. 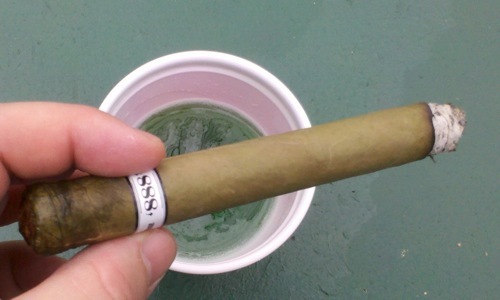 Which is why cigar makers who bring American Market Selection cigars to the U.S. market often attach their release to St. Patrick’s Day, where consumers sometimes pair them with green beer (pictured). Black Market Filthy Hooligan by Alec Bradley — This is 2013’s new addition to the candela ranks. It features the same blend as the regular Black Market (Panamanian and Honduran filler with a Sumatra binder) coupled with a candela wrapper. If you like the regular Black Market cigar, this is your best bet. Illusione Candela — Illusione makes it’s original blend (Nicaraguan binder and filler) with candela in a few sizes. Back in 2011 when it first came out, we found the 88 size to be a pleasant smoke with tea and plenty of sweet flavors, and lacking the bitterness that sometimes defines candela cigars. Viaje WLP St. Patrick’s Day — Now in it’s third annual release, this Viaje is part of the limited release “White Label Project” series. I’ve smoked a few of the 2012 edition, which features the brightest candela wrapper I’ve ever seen, and found that it equaled the Illusione as my favorite candela. Camacho Candela Monarca — Many years ago I reviewed this candela by Honduran producer Camacho. One of the first candelas I ever smoked, it features the classic banana peel and grassy notes that I strongly associate with green wrappers. Don Tomás Candela — My colleague reviewed this candela with some skepticism when the company claimed it was the result of three bales of candela wrappers that had been “lost” for 18 years. Ultimately, though, he found it to be a “respectable” smoke with enjoyable flavors, even if it wasn’t destined to be a regular in his rotation. Fuente 8-5-8 Candela — Fuente’s regular line is known for smooth, mild flavors produced by Dominican binder and filler tobaccos. I smoked one of these a few years back and recall just that: a mild, balanced smoke with just a hint of classic grassy candela flavors. Those are the candela cigars we can personally speak to, but there are a few others. La Flor Dominicana recently released their “double claro” (another name for candela). Rocky Patel makes the Edge blend with a candela for St. Patrick’s Day. And for while La Gloria Cubana also made one in a few sizes, it isn’t clear if it’s still produced. If you’ve considered trying one before, I’d encourage you to use St. Patrick’s Day as a reason to take the plunge. Pick a brand with non-candela smokes that you like, and see what a world of difference a green wrapper can make. Finally, remember that for better or worse, with enough Jameson and Guinness, any cigar is bound to taste good. Never really met a candela-wrapped cigar I wanted to try again. But, looking at this list, it occurs to me I may not have given the wrapper a fair shake… haven’t tried most of these cigars. I guess this weekend would be the time to be adventurous. My first candela cigar was a Antonio y Cleopatra machine made in about 1992. I didn't try another one for about 15 years when I had a Graycliff candela. Still not a fan. Possibly worse than green beer. Thanks Patrick, fun to try something very different every once and a while! While they won't be in my regular rotation, the Illusione, Viaje and LFDs offer fairly complex and definitely interesting smokes. Slainte!